The title came about because it just sounded interesting. "IPS" is Ignaz Philipp Semmelweis, the father of asepsis (along with Joseph Lister). I had gotten interested in his life and read parts of his textbook Die Ätiologie, der Begriff und die Prophylaxis des Kindbettfiebers while I was living in Chicago. The "textbook" part comes from the fact that each of the seven sections is named for a particular poem or book that I found of interest. While each "text" had something to do with each section, the work is not at all programmatic, and nothing should be read into the music based on what I chose for each section. 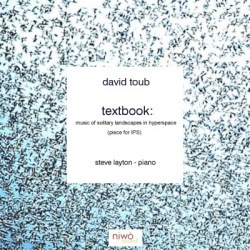 textbook is a really long piece for solo piano (over two hours in length). Each section stands alone, but I've also gotten fond of listening to this as a continuous work, in which each section flows uninterrupted into the next one. Either way works. I wrote it between 1984 and 1987, and it represents a bit of an evolutionary process relating to what I was writing during those years.